Countable makes learning about what your government is up to easy and fun. Learn about issues you care about, influence Congress with one tap voting, and rally your friends around specific legislation. Read the daily edition of the Congressional Record on your iPad, iPhone or iPod touch. The Congressional Record App is presented by the Library of Congress using data provided by the Office of the Clerk of the U.S. House of Representatives, the Office of the Secretary of the Senate, and the Government Printing Office. 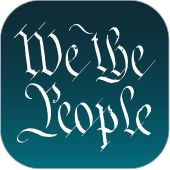 The U.S. Constitution: Analysis and Interpretation app is a mobile version of the "Constitution of the United States of America: Analysis and Interpretation", a comprehensive analytical legal treatise prepared by attorneys of the Congressional Research Service at the direction of the United States Senate and issued as Senate Document No. 112-9. The app is presented by the Library of Congress using data provided by the Government Printing Office. TrackBill puts you in complete control of state and federal legislative information, so you never miss an important bill. Track legislation across all 50 states & Congress. Whip Watch is a product of the Office of House Democratic Whip Steny Hoyer. It is designed to help House staff, the press, and the public better follow the latest developments from the House Floor. The app uses data from both DemocraticWhip.gov and DemCom.house.gov, which is the official intranet for House Democratic staff (it is only available within the House of Representatives firewall). You should be able to communicate with your representatives at the push of a button. Contact Congress makes it as easy as possible for you to get in touch and be heard. Tweet Congress -- Contact Congress | Express Your Views | Make A Difference! Tweet Congress is a simple and efficient tool that lets you contact U.S. Congressional Members instantly in 3 taps from your mobile device. Quickly locate and tweet your U.S. Representative and U.S. Senators with ease and speed, in the palm of your hands. Tweet Congress gives you the platform to communicate with your government easily, simply and efficiently. It’s the perfect way to get involved with the political process, and have your concerns, issues, and ideas voiced directly in a public forum on Twitter. Let Your Voice Be Heard. Tweet Congress Today!